The comic book Peanuts #28 goes on sale Wednesday, May 20, 2015. New stories in this month's installment from Boom! Studio include "Studs," "Sunny Disposition," and "Happy Any Day." 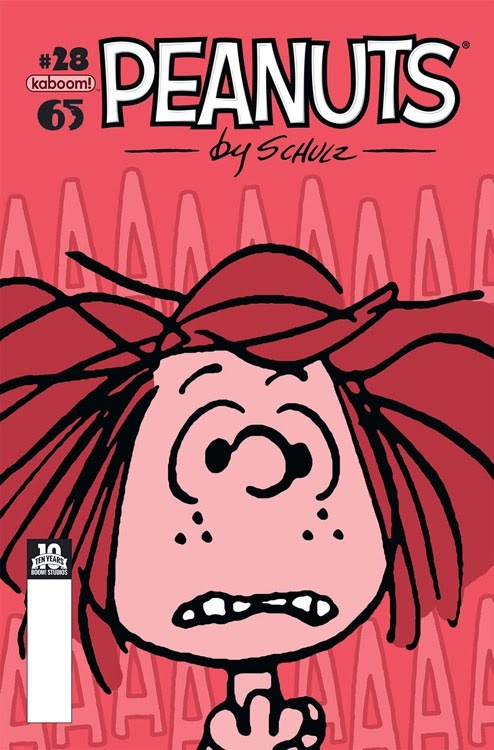 The issue also includes a "Comic-Con Pull-Out Poster" and several classic Peanuts Sunday strips. Comic Book Resources has a five-page preview. Look for the mag at your local comic book store, but if you can't find it and they can't order it for you, you can purchase it from Boom! Studio's website. It appears that the Peanuts comic book will be taking an extended break after this month - no issues are scheduled to come out in the next two months. Whether the comic book will return eventually or not is unknown. Actually, I think this is the last issue of the Peanuts comic for now published by Boom/Kaboom, though Boom/Kaboom plans to release a book later this year with many artists/cartoonists paying tribute to the Peanuts 65th. anniversary. dth1971, do you have concrete information that this is the last issue of the Peanuts comic book? I searched and couldn't find any evidence whether more were being published or not.